After hearing about the recent Wicked Kitchen launch all over Instagram I headed to my local Tesco to check out this new range of vegan ready meals. Of course, ready meals don't have the greatest reputation for being the most nutritious or best-tasting choice but having seen the photos floating around on Instagram I felt optimistic that these would be a big step up! My local store didn't have any of the lunch options (sandwiches/wraps) but had a really good selection of the ready meals to choose from. Although the pasta dishes in particular looked delicious, I opted for the Curried Cauli, Onion Bhaji & Coconut Rice and Gunpowder Potato Chana Masala as they appeared to be the only gluten-free options on offer (gluten and I have a very complicated relationship). At £4 each, they're a little pricier than your average ready meal, however I was impressed by the portion sizes and variety of elements in each meal. Another thing I noticed immediately was how the range showcases the amazing natural colours of plant-based foods; these ready meals are far from the bland. The first meal I tried was the Curried Cauli, Onion Bhaji & Coconut Rice. The meal had a mild curry flavour with some sweetness and I think it would be perfect for anyone who isn't a fan of spicy foods. I had expected the coconut flavour in the rice to be a little stronger, but I enjoyed the variety of elements included and felt you got a good amount of each one. The Gunpowder Potato Chana Masala (pictured above), as the name suggests, definitely had a more spicy flavour but I was a little disappointed by the potatoes which I thought would be my favourite element from the two meals. The combination of potatoes, rice and chickpeas also seemed to be more filling than the first meal, but both paired well with poppadoms on the side! Whilst I usually prefer to cook my own meals it's always handy to have a ready meal as backup for those days where you don't have the time or energy to cook from scratch. In the past it's not always been easy to find vegan or free from options and overall I'm pretty impressed with these two meals. The portion sizes, quality and flavours were good compared to a lot of ready meals I've tried in the past and I would likely buy these again, particularly the Curried Cauli, Onion Bhaji & Coconut Rice. It's great to see a readily-available vegan range that has so many different options, and I hope to see the range expand with some more free from friendly dishes in future. 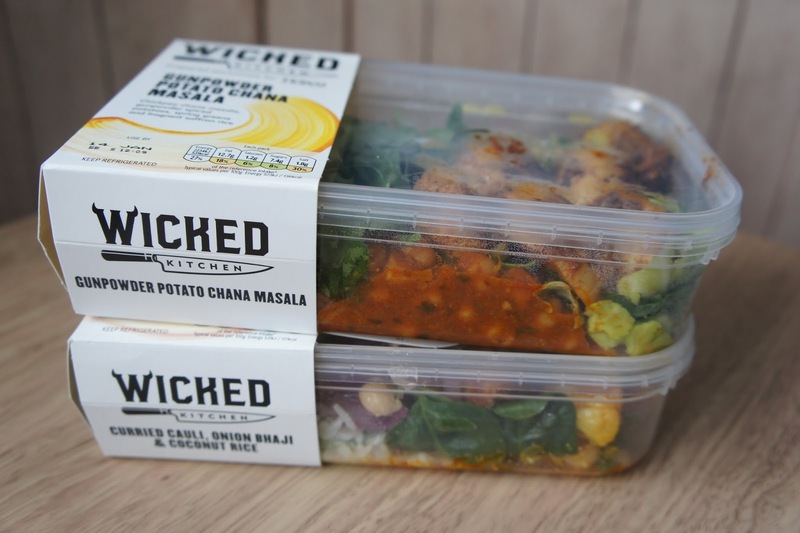 You can find out more about the range of products on the Wicked Healthy website. If you have tried anything from this new range let me know what you thought!